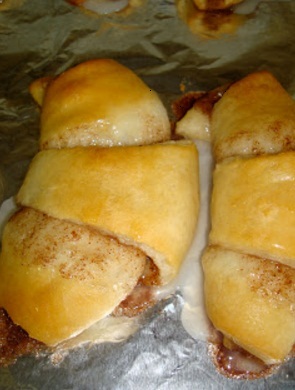 Cinnamon roll crescents are pretty famous. Each one has it’s recipe and this is mine! Check out how easy it is to prepare. 2 cans of refrigerated crescent rolls. 1 softened stick of butter. ½ cup of white or brown sugar. ½ cup of powdered sugar. Mix together the butter, sugar and cinnamon in a small bowl and beat until smooth and well combined. Unroll the crescent rolls dough into triangles and lay them on cookie sheet. I use 1 tbsp per triangle you can use more if you want. Roll up each triangle starting at the widest side and place the rolls onto the baking sheet. In a preheated oven to 350° bake for 10 to 15 minutes. To make the glaze, blend all of the ingredients together adding enough milk for the consistency you want and drizzle over the rolls while still warm. Simple, easy and sweet! I use brown sugar for this recipe and I don’t fill the crescents too much. Feel free to use as much sugar as you like according to your taste.